Day 12: Lucky! Trendy! Fishy! Oh yes! Woke up today feeling even better. Sleep is amazing. 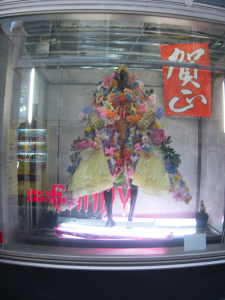 So are fluids and vitamin C.
After New Year’s in Japan (and probably like in much of the world), there are massive sales, especially for fashion. 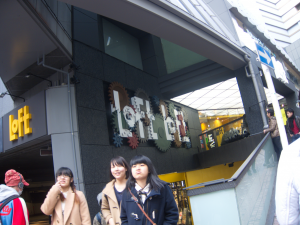 We decided to use today to go check out the trendier parts of Tokyo in order to shop for clothes. Since we planned to hit up a bunch of places today, we got the day passes for the JR line, which costs about 710yen. 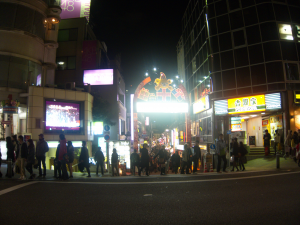 At the hostel we’re staying at, we met some people who had gone to Shibuya earlier. 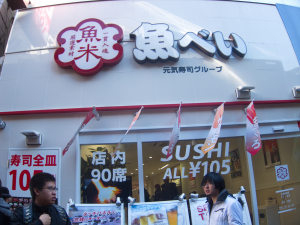 They recommend a particular sushi place called 魚べい (Uobei) there that we decided to go try. 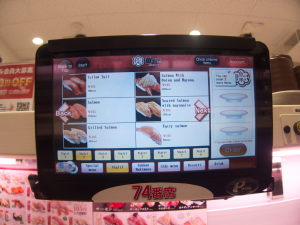 After getting your seat, you use the touchscreen above your head (which is actually a mounted tablet) and place an order for up to 3 items (usually sushi, which is all 105yen a pop). 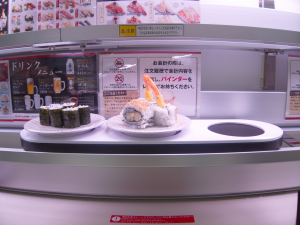 Items also include things like miso soup, fries, croquettes, beer, and cake. After placing your order, you wait. Repeat process until satisfied. Then use the touch screen to close your tab. 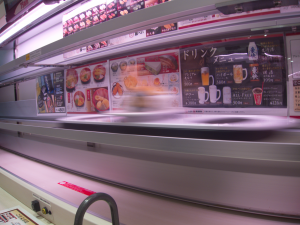 It was pretty nifty, the rails and system were a nice touch. Of course, with this kinda thing, the plates add up kinda fast, but that’s kinda the point. Bellies more or less full, we walked around Shibuya to buy stuff. We stopped by a Uniqlo so a friend could buy some cheap jeans. Looked to see if they had any special collaboration items, but they just had One Piece Z items that I wasn’t particularly interested in. 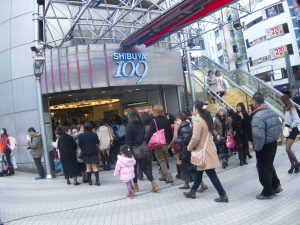 Well, except not that Shibuya 109, we headed into Shibuya 109 Men’s. 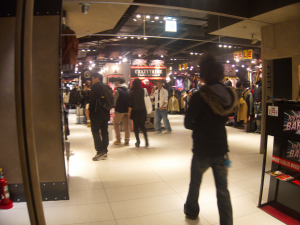 Shibuya 109 is more or less a small department store with a bunch of really trendy boutiques. 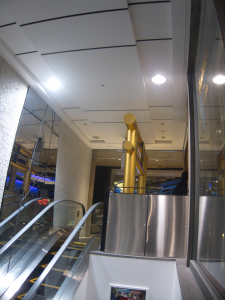 So we decided to scale the tower and check out the stores. 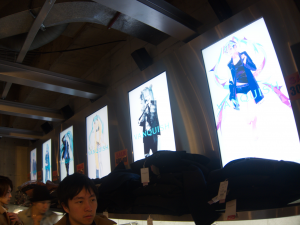 Of course, all the outfits Miku wears in the pictures are (more or less) from the shop. Gold. Like what’s coming out of your wallet. As you might expect from a place with boutiques, the prices were pretty expensive, with nice jackets being in excess of 20000-30000yen. 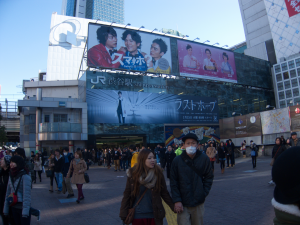 However, my party members were actually after the Fukubukuro. 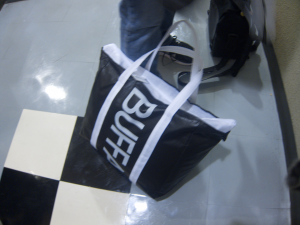 My friends split a bag from a store called Buffalo Bob’s that cost 10500yen and had 3 jackets, 1 pair of pants, 1 shirt, and probably some other stuff I don’t remember. The things are really hard to open, since they have to be to prevent peeking. We had to force the plastic zip-ties open with hostel keys. Inside were 2 fairly nice-looking jackets and a gigantic sweater thingy with hobo sleeves. 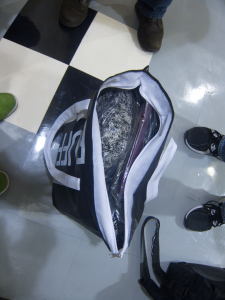 Each jacket probably retailed for over 20000yen at the boutique, so, for 10000 or so yen, not bad. 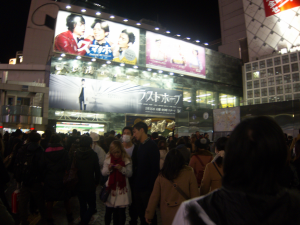 Afterwards, we decided to go wander around Shibuya some more to look for fashion. 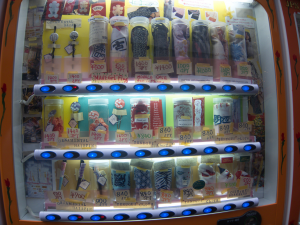 Despite how it looks, it’s actually a souvenir vending machine that sells little gifts. He’s been craving pizza buffet since we were in Odaiba, so we decided to go in and try it out (it was cheaper too, at 1180yen). We had about 1.5-2 hrs to eat our fill before they closed up and started preparing for dinner, so we got to work. They had salad, pasta (with no meat), curry rice (with no actual meat), pizza, and dessert pizza. 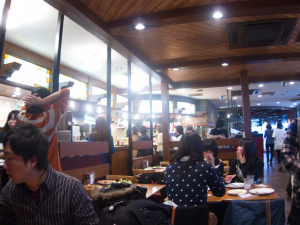 The pizzas were really interesting, with flavors like kinpira pizza and tuna wasabi corn pizza and the like. 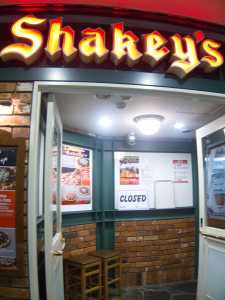 Makes me wonder what kinds of pizza I can order from a normal pizza place in Japan. By the time we finished, it was getting dark. 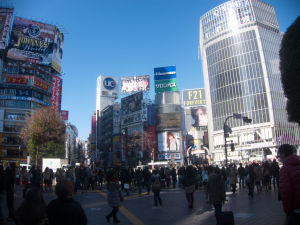 We waddled out and wandered around Shibuya some more anyway. We hit up a Big Camera to look for some things that a party member needed. Then, we tried to go to a cat cafe nearby, but unfortunately, they closed early to take care of their cats :<. Oh well, back to the station! 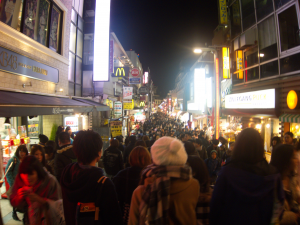 We headed to Harajuku to walk along the main street and check out the shops there. 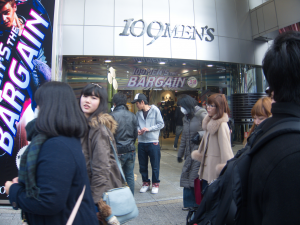 Being similarly trendy, there were also a bunch of people wandering around looking for New Year’s deals. 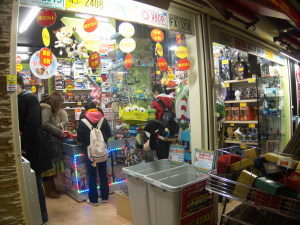 We found an interesting shop called Takara+Ichiba that had a whole bunch of sealed boxes that cost 300yen each. A whole bunch of people were gathered around, shaking the hell out of all the boxes. 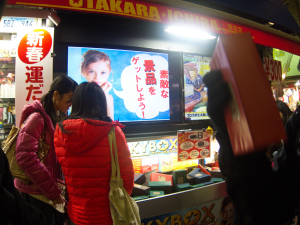 The idea is, you pay 300yen for a box, and there’s something in there. You get whatever’s in there. Usually, it’s a small trinket or something, but it also could have a slip of paper included that has a number. If you’re lucky, you exchange that slip of paper for the corresponding big prize, which ranges from large toys to game consoles to appliances. 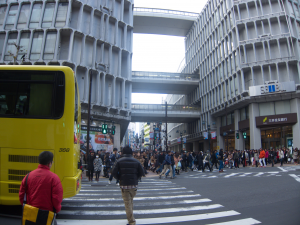 We wandered around Harajuku some more then decided to head to the Sky Tree. 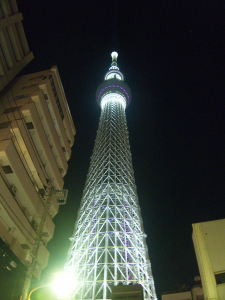 We stopped at the Kinshicho JR station and decided to do the 20min or so walk to the Sky Tree. 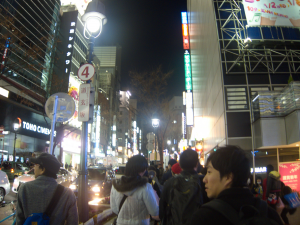 As per every other day, we finished it off with a trip to Akihabara and played some video games. Took the opportunity to play a bunch of Project Diva and UNiB at Club Sega. I played against some guy in UNiB and got Destroyed. Combos are so long and damaging in that game, and my Day 1 Linne didn’t stand a chance. 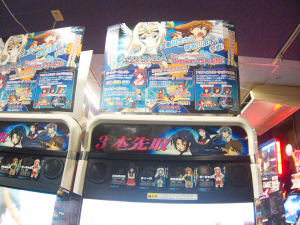 I also got the chance to play one of my friends in Aquapazza at Hey! Not sure what we’re going to do tomorrow. 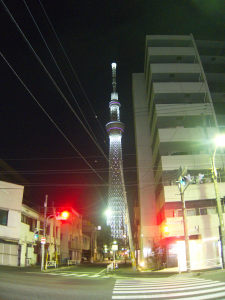 Maybe revenge on Sky Tree? Cat Cafe? We’ll see! Tagged with japan, shopping, travel.